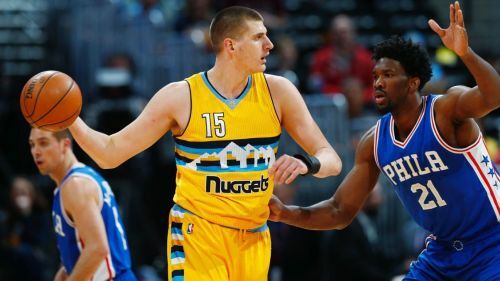 Jokic and Embiid are the two best examples of modern day bigs. Joel Embiid of the Philadelphia 76ers is widely regarded as the next Hakeem Olajuwon- a legendary center that outplayed other legends like Shaquille O'Neal. With his social media gimmicks and savagery, Embiid quickly became one of the most loved players in the NBA. What separates Embiid from the pack is his incredible footwork and ability to stretch the floor because he can handle the ball and shoot the 3 Point shot. However, there is one guy who is as great as Embiid but doesn't get even half the attention he deserves - Nikola Jokic of the Denver Nuggets. Jokic is anything but a traditional big man in the NBA. He can dish out unbelievable assists that would make an elite point guard look ordinary and his ability to shoot makes a threat from beyond the arc. If you give him space, he is more than capable of handling the ball and driving to the rack to get easy buckets. There are major reasons that Jokic isn't getting the attention he deserves. The first being the fact that his team, the Denver Nuggets have never made the Playoffs and the second being a slightly tricky one which is the fact that Jokic is a relatively quiet guy as compared to some of the other players like Embiid who are social media entertainers as well. Though Jokic doesn't like he's going to change a lot on social media, he has quietly lead the young Denver Nuggets to the #1 spot in the Western Conference where every game seems like a fight for your life. Jokic has been the focal point of the Nuggets offense in a variety of ways. He can play the low post and use his strength to over-power guys to score. His passing skills are elite and it won't be a stretch to say that Jokic is already the best "Passing Big Man" in the history of the NBA. What's even more impressive is that the Nuggets often make Jokic bring the ball up like a "Point Center" which creates mismatches resulting in favorable positions for the Nuggets. It's time we give Nikola Jokic the respect he deserves.